The first thing to do is get the unboxing out of the way and the X2-02 didn't make it difficult for us. The phone comes in a small plain box with nothing but the basics: a charger, a single-piece headset and some manuals. There's no microSD card in the package, but anything less than 4GB would've been of little use anyway in a phone, which claims to be a powerful music player. The Nokia X2-02 is quite compact, although obviously not the thinnest of phones. Aesthetics are usually secondary to usability in the low end and having two card slots on either side didn't leave designers much choice. The handset is pretty much the same size as the X1-01, at 112.2 x 47.3 x 15 mm, but surprisingly is a lot lighter - just 71 grams. There is nothing really special about the Nokia X2-02. It looks very much like its cheaper sibling - the X1-01, but brings a few design touches and hardware upgrades to vastly improve the user experience. We got the dark silver version for review, but it's also available in bright red, orange, violet and ocean blue. Up front, the display offers good enough sunlight legibility, while the alphanumeric keypad is a huge improvement over the flat numpad of the X1-01. With S40 on board, you get a proper D-pad too, with confirm action. What we don't quite like is the glossy finish of the keys, which gets easily covered in smudges. The 2.2" QVGA display is of an unusually high quality for the low price tag of the device. Viewing angles are commendable and so is sunlight legibility. The numpad has proper individual keys, which are comfortably shaped and solid to press. As usual with Nokia phones, the * key launches the dual SIM manager to let you define how either SIM card handles calls, texts and data. The navigation deck is built around a four-way D-pad with a confirmation center key. There's a soft key and a call key on either side, the layout is clean and efficient. While the controls share a single flat plate, they're well-spaced and with good press. The left side of the phone has the single music control and the hot-swappable microSD card slot with a plastic lid. The Play/Pause key will launch the music player regardless of where you are in the interface. You can listen to your music while playing a game, writing a message or browsing the web. Not bad for a phone, which doesn't have proper multitasking. The music key will turn the radio on too if that's what you've listened to last. Since the phone has a built-in antenna, the music will instantly start playing on the loudspeaker. The FM transmitter lets you stream the music on your phone to any standard FM radio receiver in the vicinity at a frequency of your choice. The right side is the phone is quite busy too - it has the volume controls and the second SIM slot. The SIM compartment is hot swappable, meaning a new card inserted is instantly accessible without a reboot. Nokia call it Easy Swap. At the top you get the 3.5mm audio jack, the standard microUSB port and the 2mm Nokia charger plug. The X2-02 doesn't have USB charging enabled. The lanyard eyelet is the only thing at the bottom. The battery cover is made entirely of matte plastic and takes the whole back. The material looks sturdy and being a matte finish means it's less likely to scratch over time. Here on the back we also find the 2 megapixel camera lens and the loudspeaker grille. The back cover is a bit hard to open as you really have to put your nails into prying it open. Maybe the idea is that once you've placed your primary SIM (slot under the battery), you'll never need to. With side-mounted hot-swappable SIM compartment and memory slot, you won't have to look under the hood. Whatever the reason, we find the end result lacking in user friendliness. On the positive side, the cover is affixed to the body really well and it's likely that it would come off on its own even if you drop the phone. The battery cover fits super tightly, no creaks, not the slightest of wobbles. 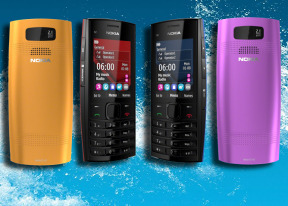 The Nokia X2-02 is powered by a 1020mAh Li-Ion battery (BL-5), quoted at more than 18 days of stand-by and up to 10 hours of talk-time.. Overall, the build quality is great, although the finish is nothing to write home about. We like the matte back, but we are not fond of the glossy front. In the end, there's no risk of users feeling they're getting less than what they paid for. Perhaps the only missing feature is the flashlight we've come to know from low end Nokia phones.